Prague has a full range of hotels, pensions and Guest Houses to suit all tastes and pockets. We have selected what we feel are the best for various reasons depending on the visitor’s priorites. Reasons for selection can be the best location, best value, most comfortable and welcoming, friendly staff, great buffet breakfast and where possible a combination of ALL these! We are not out to provide an exhaustive list but to hand pick what we feel are the best for the varying needs of our visitors. If a hotel has a special offer we will let you know at once and will always try to get you the best possible price and value. 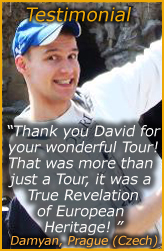 Prague Unique Tours are happy to assist you in making a booking and will secure the lowest possible seasonal rate for you. We have selected the 3 to 5 star hotels below that we personally know and that offer you a choice of locations and prices. For those who prefer the independence and privacy of a flat, please see our section offering a range of studios to 2 bedroom apartments sleeping 1 – 8 persons. If you are a large family or a small group who do not mind sharing a flat they can offer great value for money and allow you to feel more like a local resident. If you complete our ACCOMMODATION QUESTIONNAIREwe will be happy to recommend the best place to suit your individual needs and budget and secure competitive rates. Stay at the recently renovated Red Chair Pension dating back to the 15th century and live in a picture postcard backdrop during your trip to the magnificent Czech capital. Just along the Royal mile before you cross Charles Bridge to go to the castle you will see Lilova street on your left. The Red Chair dwells deep in the heart of Prague’s mystical Old Town, lost in a labyrinth of narrow, cobbled streets and yet only a short stroll from the splendour of the Old Town Square. Red Chair’s position in Prague’s very centre, nestled into the bend of the River Vltava, means everything on offer is within easy reach of your room. The pension offers a stylish and comfortable accommodation in single, double, three or four-bedded rooms. All rooms have a bathroom (shower or bathtub), toilet, bidet, satellite TV, telephone, PC port with Internet access, fridge and safe deposit. Singles from Euros.58- and doubles 65- low season. We will be happy to make your booking to ensure the best possible local rates and discounts. 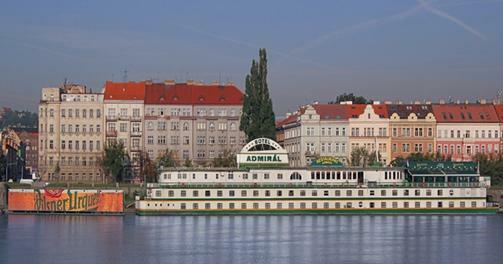 Merlin is a guest house (equivalent to a 3 star hotel) with a family atmosphere located close to the historical centre – between the Charles Square and the embankment of the Vltava river. It is situated one street back from the river near the “Dancing House”. The underground station “Karlovo namesti” (Charles Square) is 300 metres and the National Theatre is 700 metres from the hotel. There are 37 double and triple rooms and 2 quadruple bed rooms. The rooms are located on five floors (there is an elevator) and are all spacious and newly refurbished with tasteful furniture. There is a private entrance to the rooms which gives the feel of living in an apartment style hotel giving you independence. Buffet breakfast is taken in the basement café/cellar and there is also a nice garden at the back. For those wanting to be near the river but a little away from the tourist hustle and bustle this is a good choice. There are also 3 categories of room to suit all budgets – except 2 rooms of category C all are equipped with new private bathrooms. A great majority of rooms have ensuite bathrooms (category A), some rooms have private bathrooms on the corridor (beside the room, category B). All rooms are equipped with SAT TV and free Wi-Fi internet connection. On each floor there is a refrigerator and an electric kettle with crockery at the guest’s disposal. For all info and further photos take a look at the following page – we will be happy to make your booking to ensure the best possible local rates. Rates from Euros.26- single and Euros.40- double LOW season. Renovated in 2003, is situated in a small square close to the many attractions and facilities this beautiful city has to offer. One of the reasons we featured this hotel is that it is close to Vinohrady (for those who do not want one of the many apartments available) and it has a fully equipped fitness centre, with gym, sauna and jacuzzi. There are 33 luxurious rooms, each of them accurately equipped with refined craft made antique-style furniture and top quality textiles, which together help to create a romantic and pleasant atmosphere. Some rooms offer a small lounge. Facilities include air conditioning, fire detector, satellite TV, mini bar, direct dial telephone and safe. 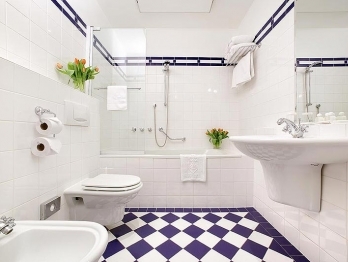 Bathrooms are equipped with a bathtub or a shower, hairdryer and set of toiletries. The pleasant breakfast room can be seen below. Rates from E.39- p.p.based on twin room with breakfast. From Wenceslas square: 500 metres. From Namesti Miru square: 100 metres. From the nearest tram stop: 20 metres. From I. P. Pavlova metro station: 20 metres. Highly recommended, Tyl Hotel in Prague is just at 5 min by walk to the National Museum and at 10 min to the monuments area, really well connected with everithing by metro and tramway (I.P. Pavlova station) and gives a really good and nice service to the customer, great confortable rooms, nice common areas, really good service provided by the employers…. 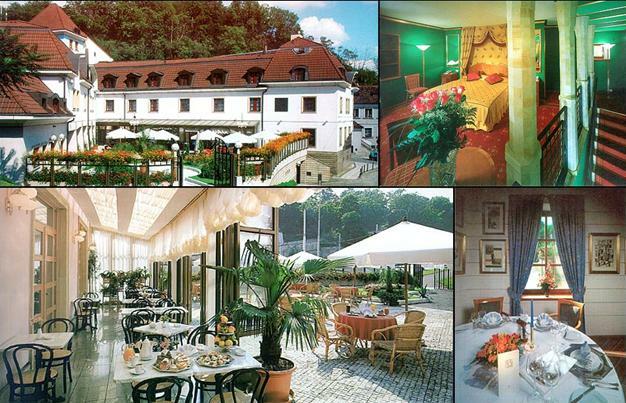 Hotel Certovka is a 4 star hotel in an original baroque house which has been recently refurbished. It is situated right next to Charles Bridge, in the historical quarter of “Mala Strana” (The Lesser Town), which is in fact a semi-island formed by a small branch of the river Vltava, the Certovka. The rooms have a view of Charles Bridge, the Certovka and the Bridge Tower. 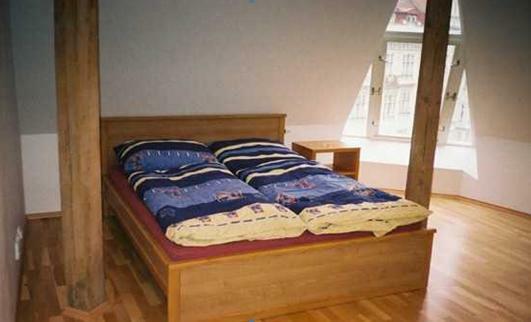 The attic rooms have also a panoramic view of Hradcany, or Prague Castle. As a guideline: Single rooms from Euros.65- and doubles 85- but there are often special offers so once we know your dates we will be happy to pass on the best possible rate to you! If you are only staying 1-2 nights and want to enjoy the main historical sites of Prague you could not be in a better location between the castle and Old Town Square next to Charles Bridge in a quiet and classy hotel. Hotel Adria is a classic recently refurbished 4 star hotel, combining the charm of the old Prague with the comfort of modern equipped rooms. The hotel’s history dates back to the 14th century, when the whole premises belonged to the Carmelitan Convent of St. Mary of the Snow. Its ideal location at the main Prague boulevard – the Wenceslas Square, and its traditional hospitality has made it a popular choice. It is located in close proximity to all Prague sights, culture and shopping centers, offices of various corporations and airline companies, but at the same time in the vicinity of a quiet pedestrian zone of the Franciscan Garden. Excellent connection to the main tram system – the entry to the subway station “Mustek” (line A & B) is located just in the adjoining building – Palace Alfa. There are 88 rooms, including studios, suites, non-smoking rooms and rooms for the disabled. Every room has its bathroom with a bathtub or shower, toilet and hair dryer. All rooms are also equipped with air conditioning, minibar, TV sets with satellite reception, pay TV channels and internal information channel, radio and direct-dial telephone. Most rooms have the possibility of fast Internet connection for your laptop. As a guideline singles are from Euros.94- and doubles 106- but check with us as we can often get discounts, specially for stays of 3 nights or more. This is not only one of the best locations but also one of the most beautiful and unspoilt Art Nouveau gems in the city! For those wanting style, authentic decor from the 1900’s when it was built, breakfast or other meals in the special elegant restaurant and a friendly service with rooms individually decorated, you cannot be at a better deluxe hotel than this. Not only that it offers great rates for a 5 star hotel thatresults in great savings compared to the famous chains like the Four Seasons! Owned by the same Czech family it also offers a more authentic local experience and is a palace for art and architecture lovers. The hotel is ideally situated next to the Municipal House and Powder Tower at the start of the Royal Route and a few minutes walk to Old Town Square. The Palladium Shopping Centre is just opposite as well as a tram and metro stop. There are 86 individually designed rooms from standard deluxe rooms to the Mucha and unique Tower Suites. As this is one of my favourite hotels I can secure excellent rates on request and also accommodate groups here. The unique Sarah Bernhardt Restaurant has a combination of Czech, French and International cuisines and there is a new Vinotheque for wine lovers. Dine in elegant Art Nouveau original surroundings and decor……as a hotel guest you also have breakfast here. A drink can enjoyed in the hotel bar and brasserie. What are you waiting for……..if you do not normally stretch to staying in a 5 star hotel be surprised and ask for the rates! Adolf Hoffmeister, the elegant globetrotter, lover of art, good food and fine wine, knew Prague’s charms. As caricaturist, painter, writer, diplomat – and above all good friend to a large number of people – he spread the fame of the secret charm of this beautiful city over the whole world. And his friends, personalities and artists with famous names, accepted his invitations, visited this magical city, and fell under its charm. This tradition of hospitality continues today: Prague’s personal luxury 5 star hotel Hoffmeister hopes to become the place in Prague where the curious come, the satisfied stay and the exacting return. This architecturally interesting building offers the highest international standards of comfort and convenience, while maintaining the charm of the historic and romantic section of Mala Strana, or the Lesser Town. The hotel is situated at the foot of the Old Castle Steps, perhaps three hundred metres from Prague Castle, within easy reach of the most important cultural sights. A special feature of the hotel is a gallery of Adolf Hoffmeister’s art work. Portraits of the most important personalities of the first half of the century, whom the artist knew and drew, give this luxury hotel a personal feel to its guests. We offer accommodation in 36 rooms and 5 suites with individual heating and air-condition control, direct-dial telephones, colour TV with satellite channels, mini-bars and all modern facilities to give an overall impression of comfort and refinement. The family atmosphere of the hotel is added to by the excellent “ADA” restaurant offering specialities of Czech and international cuisine, a cafe with summer terrace, bar and wine-cellar filled with fine local and imported wines. The prices for a deluxe hotel are very reasonable and from Euros.105- in a single or double room low season. Welcome to the Old Town Square Hotel, a small 5 star boutique and family run hotel in the heart of Prague. If you want the most central, beautiful and famous A1 location this is it!! The hotel consists of 10 unique rooms comprising of 3 double rooms, 3 junior suites and 4 family suites, which are all designed to a 5* standard and furnished with modern design furniture. The rooms range between 55 – 100 metres squared and some can be interconnected and thus create very large apartments. The hotel is furnished with modern design furniture and its bathrooms have been equipped with Philippe Starck equipment. 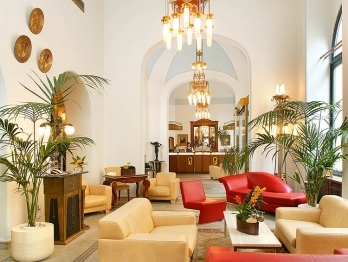 Our guests thus find themselves in baroque interiors, equipped with modern design and right in the centre of Prague. The Old Town Square Hotel & Residence is located overlooking the Old Town Square – just a few meters away from the Old Town City Hall with the astronomical clock and the famous king’s lane, leading up to the Charles Bridge. The hotel is also in walking distance of all the famous restaurants, bars, shops and sites. By staying in the centre you will save all the valuable time that you would otherwise have to spend on travelling across Prague. It will also enable you to breathe in the special atmosphere that the Old Town offers and discover the oldest but the most beautiful part of our old historical town. Prices vary and change according to season so check with us for the latest best deals and we will be happy to make a booking. The hotel is situated in two adjacent buildings, which are registered on the UNESCO list of monuments. Both of the buildings are considered to be of historical importance, and date back to the 14th century with a long and interesting history. The rooms are furnished to 5* standard hotel category and range in size from 55 to 100 m2. There is also the possibility to interconnect rooms and create larger suites. Suites are individually and sensitively created, and come with smoke detectors, safe locks, working desks, TV set with satellite reception, a direct call phone, high-speed Internet connection and a minibar. I have stayed in many top hotels all over the world, This hotel is amazing. The rooms are lovely and big and so clean. Service is second to none. I stayed here in 2006 with my family and was so impressed, i sent my mother there this year for her birthday. The management of this hotel are amazing! Hotel At The Three Storks Prague offers 20 well designed guestrooms with all the modern amenities necessary for a comfortable stay. A beautiful blend of the historic and contemporary, guestrooms are blessed with original graphics by the important Czech artist Adolf Born while the painted wooden ceilings are reminiscent of the Renaissance and Baroque period of the house. The windows offer a wonderful view over the Prague Castle and the Lesser Town rooftops. The famous Wallenstein restaurant started in the 1930’s, serves traditional Czech dishes. The stork used to be a carrier of good news and healthy home. Location: Hotel At The Three Storks is located in the tranquil area of Lesser Town, just down from the magical Prague Castle and within a short distance to all of the sightseeing, restaurants and cafes. Rooms from E.79-. Prague Unique Tours accommodation partners have been offering private apartments for discerning tourists here in Prague since 1997, so they know their clients needs, and do their utmost to make your stay an unforgettable and enjoyable one. For those wanting independence and the feel of living in the city plus a chance to make your own food, we recommend renting an apartment. There are more photos of each place and additional apartments if the selection below does not suit you. Many apartments are in Vinohrady (Prague 2) and in the historic centre of Prague 1, with several in Prague 3. There are studios and large 1 and 2 bedroom flats. Most sleep 1-4 persons and a few of the larger ones up to 6-8 persons. Selfcatering. You can have your own guests all day and night without extra charges or any questions asked. Several apartments have safes (see descriptions), but if not you may store your valuables at the owners place free of charge. Extra sets of keys are available on request. You may rent a mobile phone with Czech number and prepaid card (rates on request). All Cleaning is generally done twice a week between 11 a.m. and 3 p.m. unless you request it more times or do not require it. The owner, speaks very fluent English. He or Vladimir, his fluent English speaking assistant will be present and they will also be reachable by mobile phone for assistance. We are happy to advise and make a booking for you and below you will find a selection of several flats of varying sizes. Prices are from Euros.50- per night depending on size, season and number of guests. Located just off the main street of the elegant residential district of Vinohrady, minutes away from Wenceslas Square and the National Museum, this newly-acquired large one bedroom apartment is the ideal base to explore the sights of Prague but also provides a comfortable retreat from the hustle and bustle of city life. Also ideally situated upstairs from Prague’s most popular gay club Valentino’s and close to Saints, Termix, Element & Klub Stella. The apartment features a fully-equipped kitchen, a living room with satellite TV and free high-speed Wi-fi internet connection. The apartment on Italska Street (2 double bedrooms for 2-6 persons), offers a location between Wenceslas Square and Vinorhady as it is situated at the bottom (western) end of Vinohrady. This spacious and bright apartment (90 square meters) is situated on the first floor in a building with an elevator. The location is Prague 1, Nove Mesto, founded by the famous Charles the 4th in 1348, and there is easy access to both the historic part of Prague with all the beautiful sights as well as the many good restaurants and shops, which Prague is so well known for. Metro station Namesti Republiky and also trams are well within reach. By Namesti Republiky you’ll also find the famous Obecni Dum (Municipal House) and the shopping mall Palladium, which supposedly is one of the most modern of its kind in Europe. The apartment comprises two separate bedrooms, each with a double bed and wardrobes. The living room is furnished with comfortable leather couches and satellite TV, and here you’ll also find a good double sofabed for up to two extra people to sleep on. Furthermore there’s a separate dining room, where you can relax without disturbing the people sleeping – even if the living room is used as an extra bedroom. This charming studio offers excellent value for the single traveler and is situated in the heart of the historic old city, in Hastalska street. From the small square in front of the building you have a view directly on the Tyn Church on Staromestske Namesti (Old Town Square). So all the exciting sights of Prague are right in front of you waiting to be discovered. The street is quiet, and beautiful houses surround it. The accommodation consists of a roomy living area with a large double bed. For your comfort there’s also a sofabed, where you can relax in front of the TV/dvd or listen to your favorite Cd. One extra person can sleep here. There is a kitchenette fully equipped and separate bathroom. FINALLY for those looking for something different and on water why not stay on a BOAT!! ON REQUEST: Our favourite mystery BOTEL in a great location with a super restaurant and outdoor deck with views of the castle!! As it is small we do not want it overrun with requests so just let us know if you want more info and to make a booking and we will be happy to uncover our little secret and share it! A cosy well equipped boatel, with an excellent restaurant and terrace. You can find it 10 minutes from the city centre by tram, very close to one of Prague’s biggest swimming stadiums in Podoli. IF YOU HAVE MADE YOUR CHOICE OR HAVE A FAVOURITE PLACE TO STAY NOT LISTED BY US WE WILL BE HAPPY TO MAKE A RESERVATION AND SECURE THE BEST POSSIBLE LOCAL CURRENT RATES……THEY OFTEN CHANGE SO DO NOT ALWAYS ASSUME THE INTERNET RATE LISTED BY AN AGENT IS THE BEST DEAL! 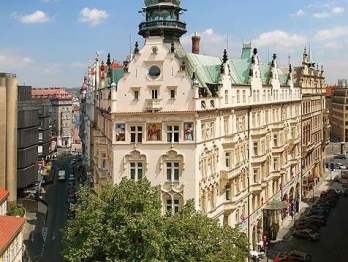 IF YOU LOVE PRAGUE WHY NOT CONSIDER BUYING A FLAT?! A2ZPrague REALITY OFFERS A FULL SERVICE TO SUIT YOUR NEEDS, LOCATION & BUDGET.